Last year, Travel Supermarket collaborated with Venture Photography to create a competition where photos were taken with specific colours as the theme; Capture the Colour. This year, there is a new twist. The competition is focused on the same idea, but this time, the photos are to be taken by children. Arise the Kids Capture the Colour competition – original I know. By some fluke, I spotted the announcement of this competition on the Mammasaurus Blog soon enough, and typed my application fast enough, to be provided with a lovely Fuji camera for the children to snap away to their heart’s content. 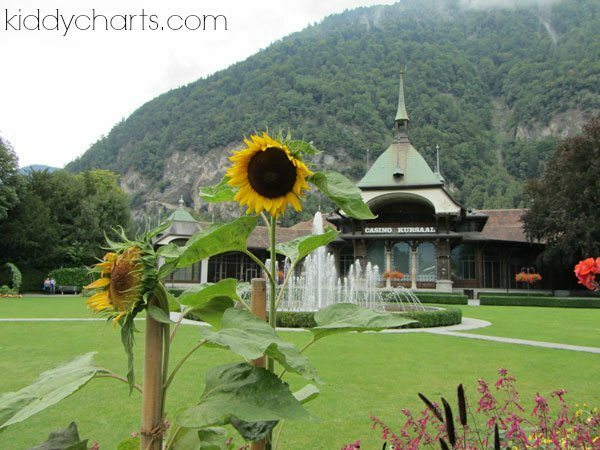 Interlaken is very flat, nestled between two lakes, but with high mountains either side of it. 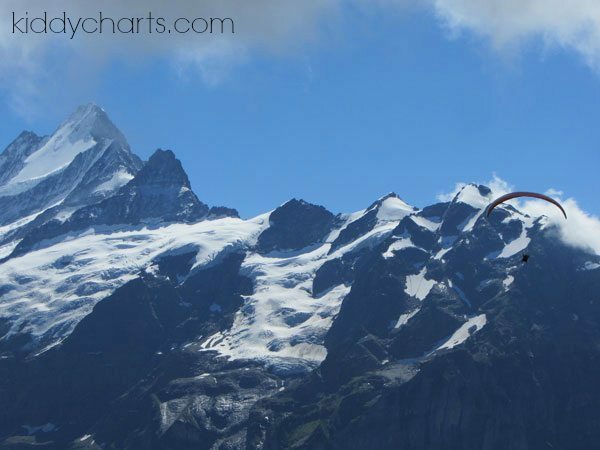 This makes it the perfect location for Paragliding, which fascinated Stuntboy – here is one of his pictures of a paraglider (slightly off centre naturally) descending into the valley. The shot is taken from the top of one of the mountains. Climbed, of course, with the aid of the many ski-lifts in the mountains. Stuntboy was keen to try this out – I was less keen to let him…. It is not easy to work out what this actually is…can you tell? 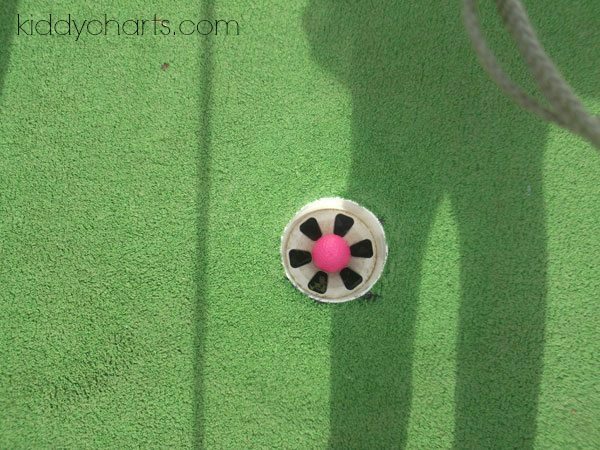 It’s a crazy golf ball, in the hole after Chatterbox managed to get it there – she was proud of it, so she took a picture, and why ever not? We visited the Dinosaur Safari Golf Course over the holidays to celebrate my sister-in-laws birthday. The kids adored it, and wanted to take lots, and lots of photos of the dinosaurs, but somehow this was the the picture they wanted to enter. I guess, to my daughter, it shows the trip was a success! Welcome to the Heimwehfluh, an amazing experience for the kids. But a rather scary one for the parents, particularly when you let you seven-year old take control of the speed, before realising that perhaps that’s not a great idea…maybe in ten years time when they can actually learn to drive…. The views from the top of the run were just as stunning as the descent through the trees. Stuntboy took a wee snap of the red flowers as we broke from the excitement. An oasis of calm before the storm perhaps? So there you have it, Stuntboy and Chatterbox’s five entries into the competition – what do you think? It’s wonderful seeing the world through a child’s eyes, isn’t it? Note: This blog post is an entry into the Kids Capture the Colour competition #kidsctc. We were sent a camera to take part, and these photos have been taken either with our camera, or the camera provided to us; depending on the date they were taken. This post is very useful information for me, I’m really like it. I vote for the green one because I like to use macro photography technique. Well done Chatterbox. I’m not sure I can pinpoint which one is my favourite photo, they are all gorgeous. Thanks – from the kids! Wow, those are amazing photographs, good luck! Thanks my dear – they had help – the location was amazing! they are amazing photos Helen, some very talented photographers you have there!